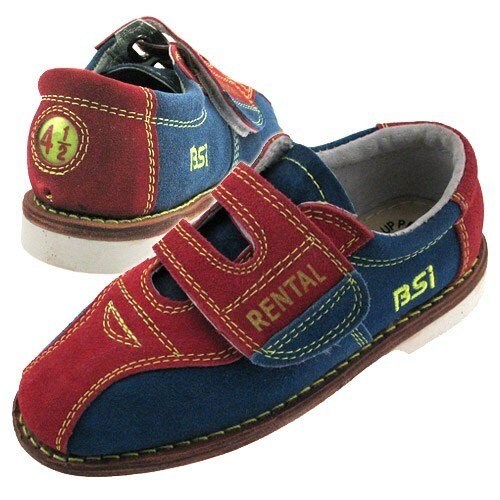 Check out these BSI Rental bowling shoes made with 100% Brushed Leather. These shoes are designed to be durable and long lasting. BSI also has added some fun to these shoes by doing glow stitching! The shoe logo and sizing also glow in the dark. Light the alley with these cool shoes! I bought a few pairs of these shoes for my daycare kids to use through out the summer for [@]! Great value and saved me a lot of activity fees money! We decided to purchase shoes for our three children in anticipation of many games of recreational bowling this summer. The sole on these shoes is not particularly flexible, but the upper leather shoe is like suedey butter. I checked 'stylish' because my daughter INSISTED that she wanted a bowling shoe that 'looks like a bowling shoe' - none of those plain white sneaker looking ones :) Very nice starter shoe. We use this just for the summer bowling events to keep kids busy. These shoes are ok, they do the job. Have saved me alot of $$$ from having to rent shoes. But they are small. As a commented earlier I returned my size 11 and got size 13 for my daughter. These fit her fine. So she is normally a size 9-10 and I had to order her 13s. I bought these for my daughter. She wears a size 12, and I bought a size 13 thinking she would grow into them. I was surprised when they came in the mail, and we couldn't even get them on her feet. Very disappointed. Best bowling shoe for small children that I have found. This shoe is soft suede, more flexible and less "clumsy" than most house shoes. The sizing seems to be a bit smaller so I recommend buying 1 size up. They are smaller than regular size. The top of the shoe feels tight, but velcor also to make it a little wider. The shoes are a bit stiff, but if they are only being used for occasional bowling, it's not big deal. My kids didn't complain about them and were glad to have their own shoes. For the price, these were definitely worth it. Originally bought girls size 13 (always rented size 12 at bowling alley and they fit fine) and they were too small. Reordered size 1 and they fit fine. The shoes arrived supprisingly fast, which was nice. The appearance of the shoe is very nice and of a high quality. The down side is the show is narrow and runs very small. I got these for my grand daughter which is a size 11 and we bought her a 12 and they almost don't fit. cute shoes for a child. same shoe good for girl or boy. shoes run 1 size small. so if u need size 1 order a 2. velcro much better than shoe laces for kids. lightweight, stylish, well made, a little pricey but beats paying shoe rental. shoes bought for my daughter for the bowling summer special. My daughter is 6years, confused about the sizes she is size 13, is that toddler size or youth?? Hi Gretchen, if you're daughter wears a size 13, then that is the size 13 in our Toddler sizes. Sometimes these sizes are listed as "Children's Sizes" but they are equivalent. Great question, May! The shoes are brand new. "Rental" is more pointing towards the style of the shoes. These are the kinds of shoes that bowling alleys will purchase in bulk and rent out to their customers. Do these run large, small, or true to size? Due to the time it takes to produce the BSI Girls Suede Cosmic Rental Shoe ball it will ship in immediately. We cannot ship this ball outside the United States.